Looks like the last two representatives of Grand Theft Auto's formative PS2 era will soon arrive on PS4. The ESRB (the folks that assign ratings like E for Everyone and M for Mature to games in the US market) posted new listings within the past day for Grand Theft Auto: Liberty City Stories and Grand Theft Auto: Vice City Stories, both for PS4. Listings also appeared for Rockstar's Max Payne 2: The Fall of Max Payne (developed by Remedy Entertainment) and Midnight Club 3: Dub Edition on PS4. You can see the new ratings from the ESRB's site below, with Mario & Luigi: Superstar Saga + Bowser's Minions putting in a cameo appearance in the middle. Hello, Mario brothers! Both Liberty City Stories and Vice City Stories came out first on PlayStation Portable, though they were followed soon after by PS2 ports. They each use pre-existing settings and recurring characters to stage prequel crime dramas: in Liberty City Stories, you control Toni Cipriani, who appears as a mob boss in GTA 3; and Vice City Stories stars Vic Vance, the brother of Tommy Vercetti's not-so-good friend Lance Vance. Vice City Stories also has an in-game Phil Collins concert, so that's something. 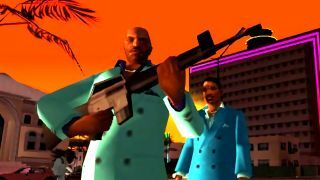 GTA 3, GTA: Vice City, and GTA: San Andreas are all already available on PS4, so soon you'll be able to play the entire PS2 era of Grand Theft Auto in one place again. Wait, does Grand Theft Auto Advance count? I mean, it came out in that time period but it was a Game Boy Advance game… Whatever, it's fine. As for the other two games, Max Payne 2 remains one of my all-time favorites; for my money, you still can't find better cinematic action gunplay. And I never played Midnight Club 3 but I do know the world could always use more streetlights reflecting off of rain-slick asphalt.